What Does ATSC 3.0 Mean for Stations and Traffic Teams? - WideOrbit Inc.
What Does ATSC 3.0 Mean for Stations and Traffic Teams? An exclusive interview with Anne Schelle of Pearl TV. Anne Schelle, managing director of Pearl TV, will lead off WideOrbit Connect’s first day of content for broadcast television professionals with a presentation on ATSC 3.0, the next-generation broadcast platform that’s dominated industry news over the last few years. There is nobody better placed in the entire TV industry to discuss the business and technology implications of this new broadcast delivery platform and how it will affect the day-to-day lives of industry professionals. With a reach of more than 300 local broadcast TV stations, Pearl TV business alliance includes eight of the United States’ largest broadcast companies, including Cox Media Group, the E.W. Scripps Company, Graham Media Group, Hearst Television Inc., Meredith Local Media Group, Nexstar Media Group, Raycom Media, and TEGNA, Inc. Pearl TV invests in next-generation technologies and services with the aim of allowing member stations to continue to monetize their content across platforms. We caught up with Anne for a quick talk about ATSC 3.0 and what its introduction will mean for stations and traffic teams. Be sure to join us at WideOrbit Connect’s TV track on Tuesday, August 21 at 9:10 a.m. for much more on ATSC 3.0 from Anne. Why are Pearl TV station groups excited about ATSC 3.0? Television viewership continues to be very strong, but we’re now living in a world where audiences are consuming content across platforms and not just a big screen at home. Today’s over the air broadcast platform was invented a quarter century ago and has served us well, but it can’t match the capabilities that exist today for advertisers from cable or Internet technology. ATSC 3.0 will enable stations to utilize the broadcast spectrum in new ways and create a flexible environment for getting information to consumers. It marries over-the-air with over-the-top for the viewer. How will ATSC 3.0 improve the TV viewing experience? Next-generation TV can deliver High Dynamic Range video (HDR) that offers a huge leap in quality. Better audio is part of the new standard, as is the capability to offer 4K content. Equally important are the personalization features that will give broadcasters a much better idea of popular programs and tailored content, including advanced emergency alerting for viewers. Will ATSC 3.0 help broadcast TV compete against digital media? Digital-only players have had the advantage of the Internet’s flexibility. ATSC 3.0 helps to level the playing field by giving broadcasters access to these advantages along with unmatched reach in local markets. ATSC 3.0 is built on an Internet Protocol backbone, just like other content delivery services on the Internet. Stations can produce an HTML client that delivers content to IP addresses over the air, and vice versa. With permission, local broadcasters will be able to collect and analyze audience data that helps them provide personalization for viewers and improve advertising. What can you say today about how ATSC 3.0 will change the work of traffic and station operations professionals? For the most part, today’s traffic platforms are limited to linear TV inventory. They will need to evolve enhanced workflows to allow broadcasters to layer in ATSC 3.0-enabled addressable advertising whether it is sold by digital, linear or a hybrid team. In time, cross-platform measurement, automation, and optimization will be key to success. Enabling an open framework that allows for frictionless planning and transactions across the systems that will support 3.0, 1.0, and OTT will be essential; something like the TIP Initiative that is tackling linear currently. WideOrbit could certainly lead the way. How soon will ATSC 3.0 replace ATSC 1.0? It’s going to take some time to deploy the new system. The FCC approved the technology for voluntary deployment last November and the first round of technical standards were finished in January. We expect compatible devices will start getting to retail shelves in 2020. Americans are already buying more than 45 thousand Ultra HDTV sets every day, and there about 30 million Smart TV’s sold each year. We’ll see a pretty strong uptick in adoption if ATSC 3.0 compatibility is built into future TV sets. There’s also potential for introducing plug-in receivers and new set-top gateway receivers that could allow many devices in today’s home to receive the new broadcast standard via home Wifi connections. What are you looking forward to at WideOrbit Connect 2018? I’m very excited about coming to Connect! 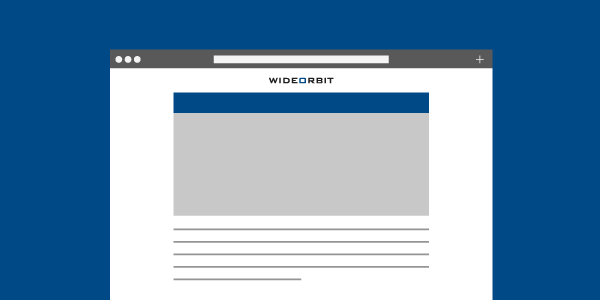 WideOrbit is a longtime strong partner to broadcasters and a leader in enabling the monetization of broadcast advertising. It will be great to have a chance to talk to traffic and operations pros who are going to be leaders in the transition and have a huge impact on the industry’s future. Plus, I love San Francisco. Thank you, Anne! We look forward to meeting you in person and seeing your presentation at WideOrbit Connect. If you haven’t already, please plan to join us August 21-22 in San Francisco for WideOrbit Connect 2018, the premier event for broadcast traffic professionals. Just click over to our dedicated event site at http://wideorbitconnect.com to learn more and reserve your spot.